You'll be £24.00 closer to your next £10.00 credit when you purchase Allied Railways of the Western Front - Narrow Gauge in the Somme Sector. What's this? The Somme sector of the Western Front was held by French forces until early 1916, when the British and Dominions Third and Fourth Armies moved into the northern part, before the joint First Battle of the Somme from July to November 1916. In 1917, with the German withdrawal to the Hindenburg Line, British responsibility moved further south. By early 1918 the British Third and Fifth Armies were responsible as far south as east of Noyon. In Spring 1918 the German attack and advance from the Hindenburg Line came west almost to Amiens. However the British and French Armies finally stopped the advance, and from August 1918 drove the German Army back eastwards until the Armistice on 11 November 1918. In this book the metre gauge networks established before the First World War are examined. Then the build up of light (60cm gauge) railways, initially mainly French but later British, in 1915 and 1916, is considered, with an assessment of the contribution of these and the metre gauge lines to the war effort. With the major movements of the front line in this sector in 1917 and 1918, the response of the narrow gauge railways is considered chronologically as well as by area, in the context of overall railway policy and development. After the war the light railways contributed to the reconstruction of the devastated areas, and then in some places served the sugar beet industry. The metre gauge railways were rebuilt or repaired. The story is followed to the closure of the last of these railways in the 1960s. 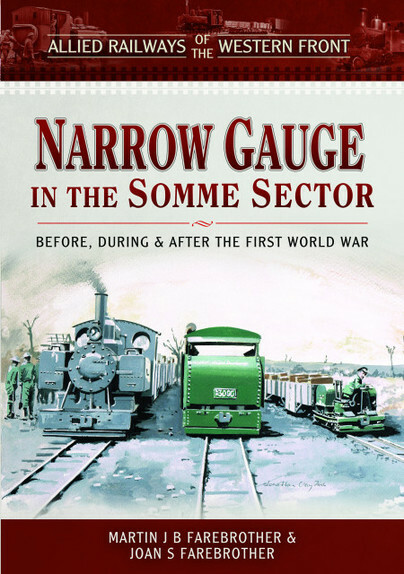 This book is a companion volume to Narrow Gauge in the Arras Sector (Pen & Sword Transport, 2015) by the same authors. It refers also to other previous works on British and French railways in the First World War, but contains sufficient information to stand alone. It describes how to find key locations now, and where rolling stock can be seen. Some walks are included for those who wish to explore the territory. So this is a high-quality publication, and a detailed historical record of the subject it covers... it is an interesting and informative book, and much more than a textbook. The style is factual and informative, but also warm, and respectful of the horrors of the war. The excellent maps and the selection of period and modern photographs enhance the text in portraying the geographical and social context of the reality in which the railways were built and operated. Of course those with an interest in the narrow gauge railways of the first world war will find this book of great value, but it will be of interest to railway enthusiasts generally, and also to those interested in the military aspects of the war. The word “Encyclopaedic” is often over used in book reviews but in the case of Narrow Gauge in the Somme Sector it is a most appropriate term. Whilst fully illustrated the book is full of facts about narrow gauge railways in this area of France. Concentrating on the importance of the railways in the Great War the book also covers before and after the conflict. The book starts with the origins of the metre gauge of the Somme and the Oise and Aisne départments from as early 1895. These established the networks but it was the 60cm gauge operated by the French and later the British that made a significant contribution in the area to the Allied war effort. In every major conflict, from Crimea to the Second World War, railways played a vital strategic role. In the First World War, narrow-gauge light railways also took on an unprecedented tactical importance in keeping the troops and guns supplied. For anyone with a serious interest in French narrow-gauge railways in general, and the Light Railways of the First World War in particular, this comprehensive and thoroughly researched book will amply reward the time taken to read it thoroughly and is an invaluable reference source. Ultimately a book that helps us to better understand the Allied war effort with regard to the railways, to appreciate the human operosity even in wartime, to know better a world (the railway one) for me new and extremely interesting and Pleasant.